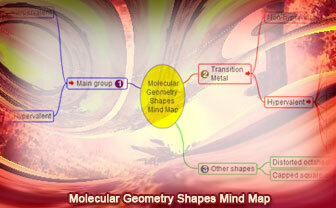 Molecular Geometry Shapes, Interactive Mind Map. Elearning. Molecular Geometry Shapes, Interactive Mind Map based on Molecular Geometry. Molecular geometry is the three-dimensional arrangement of the atoms that constitute a molecule. It determines several properties of a substance including its reactivity, polarity, phase of matter, color, magnetism, and biological activity. The angles between bonds that an atom forms depend only weakly on the rest of molecule. Read more at Wikipedia: Molecular Geometry.